Breaking the bonds between oxygen and hydrogen in water could be a key to the creation of hydrogen in a sustainable manner, but finding an economically viable technique for this has proved difficult. Researchers report a new hydrogen-generating catalyst that clears many of the obstacles – abundance, stability in acid conditions and efficiency. In the journal Angewandte Chemie, researchers from the University of Illinois at Urbana-Champaign report on an electrocatalytic material made from mixing metal compounds with substance called perchloric acid. Electrolyzers use electricity to break water molecules into oxygen and hydrogen. The most efficient of these devices use corrosive acids and electrode materials made of the metal compounds iridium oxide or ruthenium oxide. Iridium oxide is the more stable of the two, but iridium is one of the least abundant elements on Earth, so researchers are in search of an alternative material. Yao Qin, a co-author and former member of Yang’s group, first experimented with the procedure for making this new material by using different acids and heating temperatures to increase the rate of the water-splitting reaction. The researchers found that when they used perchloric acid as a catalyst and let the mixture react under heat, the physical nature of the yttrium ruthenate product changed. “The material became more porous and also had a new crystalline structure, different from all the solid catalysts we made before,” said Jaemin Kim, the lead author and a postdoctoral researcher. The new porous material the team developed – a pyrochlore oxide of yttrium ruthenate – can split water molecules at a higher rate than the current industry standard. Yang and his team looked at the structure of their new material with an electron microscope and found that it is four times more porous than the original yttrium ruthenate they developed in a previous study, and three times that of the iridium and ruthenium oxides used commercially. The next steps for the group are to fabricate a laboratory-scale device for further testing and to continue to improve the porous electrode stability in acidic environments, Yang said. Graduate student Pei-Chieh Shih, Zaid Al-Bardanand and Argonne National Laboratory researcher Cheng-Jun Sun also contributed to this research. Story Source: Materials provided by University of Illinois at Urbana-Champaign. 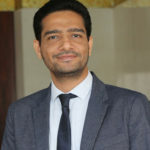 Vijay Soni is Ph.D. in molecular biology, microbiology, and immunology together from BITS-Pilani, Hyderabad campus and National Institute of Immunology, New Delhi, India. Currently, he is working at Weill Cornell Medical College-New York (U.S.A.) as a postdoctoral research associate. He is an expert in innovations and its translation. He is also the founder of "Scipreneur" which is a platform for the Scientific Entrepreneurs. Innovations and creativity are his passion.